I’ve been to the grocery store a couple times since I last posted about a new “no groceries challenge.” I’ve felt like I’m mostly remaining faithful to the challenge, though, as I haven’t gone to the grocery store and filled up my cart with a month’s worth of food. A few times I’ve gotten fresh fruit and vegetables (acceptable on my challenge) and a few snacks-for-camp-lunches. Oh. And tofu. And laundry detergent. It’s true that I haven’t let much go to waste in the refrigerator, and I’ve used much of what was stored in the deep freezer. That’s good. I haven’t purchased unnecessary items. That said, I’ve been seriously kidding myself. I maxed out our restaurant budget line (pizza and Chinese takeout, pre-made food at the grocery store, all the way up to actually going to a sit-down restaurant) two months in a row — I only started this “challenge” at the end of June! Playing poor isn’t at all the same as actually being poor. My bank balances are perilously low, and I depend on every check I get to meet my expenses. I’m not financially comfortable. My nerves get shaky and the stress of it does impact my life, but it’s nothing like actual poverty. In October, I spent $150.02 on groceries. Some people will see this as not much money, some will think it’s a lot. Regardless, my “no groceries challenge” has been successful thus far for a lot of reasons. Most important to me, beyond the money savings, is my return to awareness of and appreciations for the freedoms that come with having “enough” money. Every time I think about this voluntary activity, I’m reminded of what it was like when I literally—and I mean literally—had less than $10 to my name. No credit. No cash. That level of financial crisis didn’t last very long for me, but it made an impression. 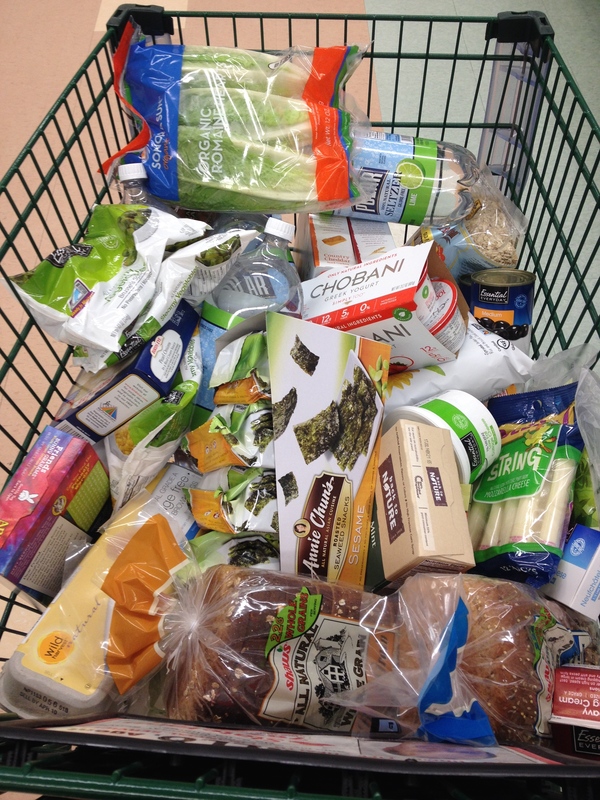 Part of why I do these “no groceries challenges” is so I’ll remember what that was like; when there was no choice. What I hadn’t thought about was the impact being “without” money for groceries can have on our social life. We had friends visit us at my parents’ summer place and I wanted to feed our friends. They all chipped in, too, and my parents were fine with my using stuff they already had on hand. But what about people who don’t have the money to buy food for friends? My friend is coming from out of town tonight, and I’ve talked to her about this no groceries challenge. She knows about it, but I got upset and anxious because I wanted to try and keep going — how can I be a good host if I need to use only what I have on hand? Of course, I could do it. I’ve been feeding my children just fine, thanks to the freezer, the pantry, and a lot of talent and creativity in the kitchen. My friend also understands and asked if I’d mind if she got herself some things in support of my decision to avoid grocery shopping. Over the course of the month, I got cider and cinnamon sticks (for the Halloween gathering with friends) and I got milk and yoghurt. I must have gotten other items, made other “exceptions” beyond fruits and/or fresh veggies? to have a balance as “high” as $150. I’ve decided to stock up again, today. I’m still considering it a no-groceries challenge because after this I will go back to not going at all. I’ll buy the items on this list, which includes some green tea and heavy cream for my friend, and then we’ll hunker back down again and not go to the grocery store for as long as possible. I’ll get a small turkey, or maybe even a chicken, and some cranberries for our Thanksgiving — I can make the rest of the meal with what we have. It’s now an intellectual exercise borne of necessity, but avoiding “grocery shopping” like this continues to open my eyes to many issues: efficient use of our food, the impact of poverty on social lives, what are our family’s values? So, it’s not truly “no groceries,” but it’s still a challenge from which I’m learning a lot. Note: As I’ve written about in my Bangor Daily News column, I don’t consider myself truly poor. I hope to use my experience with poverty to help other people (who haven’t experienced it) understand poverty better. Today I received two envelopes from DHHS. We no longer qualify for food stamps. I’m not panicked, but I am a little worried. My financial situation has improved and my benefits have been only $14 a month for some time so on the surface it’s not a dramatic cut. However, as a food stamps recipient there are other benefits that will now cost me money. School lunches will no longer be free. I also won’t qualify for several scholarships for my children’s activities. More than this relatively costly change, though, the mail contained what I now know is a very typical mixed and confusing kind of message from the DHHS. 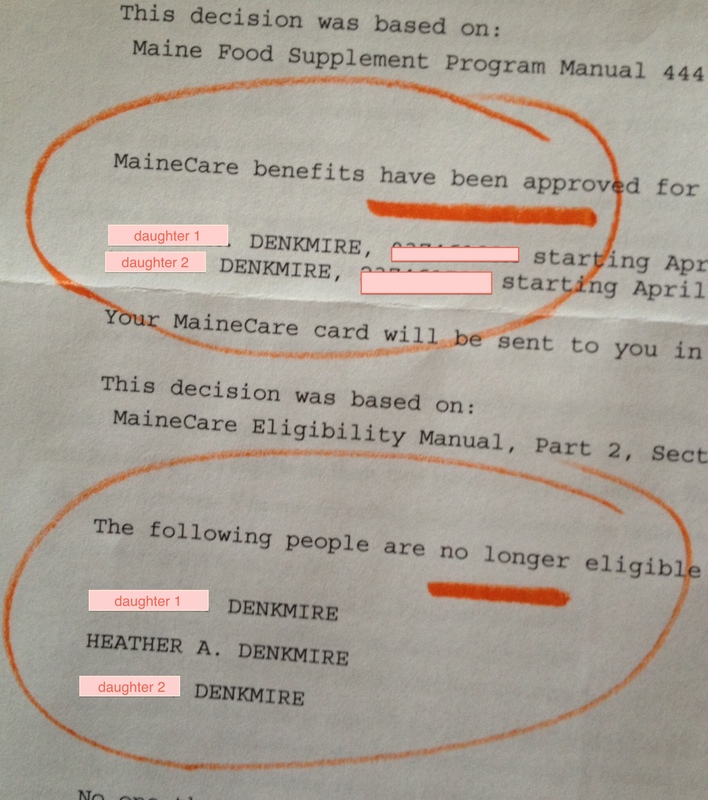 As you can see here, both packets contained information about our eligibility for MaineCare. We all qualify. Oh, no. We don’t qualify. Yes, we do! No, we don’t. At this point, I suspect I don’t qualify but my daughters will. This means I will have the help to cover the co-pays required by their father’s health insurance plan. That makes a good difference for me (if they are actually covered). In this report from DHHS, none of my childcare expenses are showing even though I entered them in my last recertification submission. Does this mean they no longer count? Does it mean something got dropped? I will need to call to find out, in case it makes a difference in the equation. One phone call alone is unlikely, based on my experience, to give me a helpful answer. It will also very likely take at least 15 minutes just to get someone on the phone to answer my questions, if I don’t get disconnected by their phone system several times as I’m on hold (which happened to me more than a few times). And, finally, did you know these benefits are determined based on gross annual income? As my business grows in significant ways (yay! ), my costs also grow (necessary boo). In fact, last year, more than 60% of my income went to expenses like my assistant, subcontractors, essential database subscriptions, and website maintenance, for example. My income didn’t really increase very much in the end. That doesn’t matter to DHHS as they don’t consider expenses in their calculations. I’m not desperate, and there is no crisis right now. But, I am now in a much more precarious position. These new $20± items add up quickly. Loss of a larger client, or when (not if) my 215k-miles car breaks down for good, my financial situation will be dire. Despite this, I’m able to know that we’ll make it through okay. I know this because because of my experience as a person who comes from privilege. I know it will get better and I have the skills and support systems to get me through the scary times. Most truly poor people don’t have my advantages. Where I am now is frightening, but I won’t lose hope. Living day-to-day without the knowledge that things will get better—while they won’t get better for most people living in real poverty—would be nearly impossible to survive. As I dumped out my tea because it was too bitter without milk, I thought about going to the market. Eggs, milk, and some fresh vegetables (maybe fruit, though I have a few apples and a grapefruit left). I have to decide how firmly committed I am to my current no groceries challenge. It’s only been 10 days. But, it’s been 10 days. My younger daughter was vomiting last week and I got an “oral electrolyte solution,” oyster crackers, and ginger ale. It was cheating on the challenge, and I knew it. I valued my ability to make that choice. I thought of people who would find themselves unable to buy things for their sick children. Maybe they don’t have the money, maybe they don’t have a co-parent to help with transportation, or maybe their own health issues meant they needed to stay home. I felt grateful. I’ve reached the point in this challenge where I have been looking at my pantry with more interest. While the girls are with their father, what meals can I prepare ahead and freeze? What treats for lunch boxes or after school snacks can I make now for later in the week? On Friday, I picked up the final share in my “meat share,” from Wolf Pine Farm in Alfred. I paid for it over the year last year, thanks in great part to my SNAP benefits, back when I received more than $14/month. This means I’ve got more meat than I feel I know what to do with. Thank goodness for my deep freezer. Again, I feel grateful. 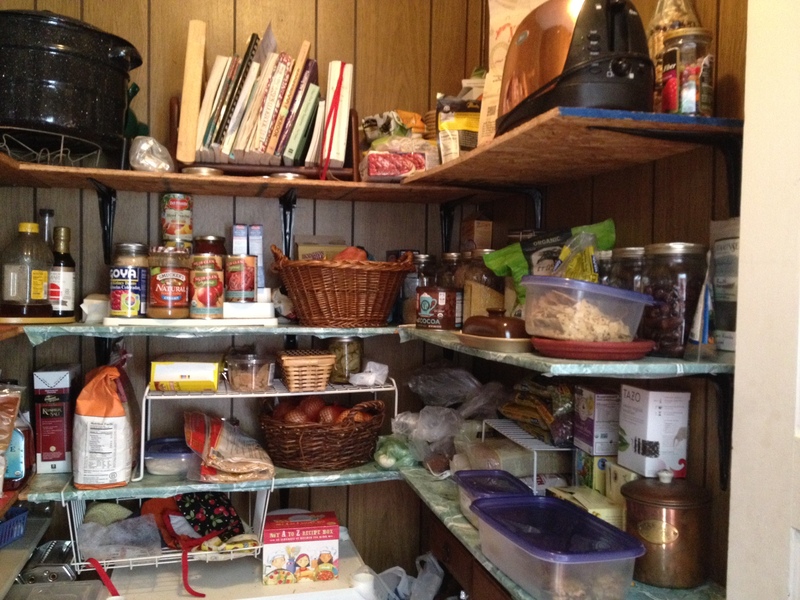 I have pantry space, freezer space, and I know how to use food strategically. Flinching feelings of “deprivation” or frustration only make me more aware of how much I really do have. Limiting it to milk, eggs, and fresh produce, (and maybe some chocolate), I will go to the market today. I get to do that without serious consequences. I’m very lucky.